The fields of science, technology, engineering and math (STEM) are critical to the future of Hawaii and the U.S., with major initiatives launching nationwide to ensure that today’s students become tomorrow’s innovators and leaders. Next month, the inaugural Hawaii STEM Week will bring together a wide range of local stakeholders to highlight these critical areas of education, and encourage greater community support and industry engagement. Scheduled to run concurrently with the Hawaii State Science & Engineering Fair (HSSEF), STEM Week will feature events to recognize excellence among Hawaii’s schools, connect students and practitioners with relevant employers and careers, and award local institutions for their work in advancing STEM education. The on-site Industry Exposition and Job Fair will give local businesses and organizations an opportunity to demonstrate their technology and services to students, educators, and even investors. Firms working in Hawaii’s dual-use industry will be well represented, sharing their latest work and available career opportunities. The STEM Institutional Awards Banquet will highlight educational institutions that strive to make STEM activities ubiquitous in every student’s educational experience. The program will honor schools that promote a rich variety of STEM activities and offer students many entry points for involvement in STEM education. 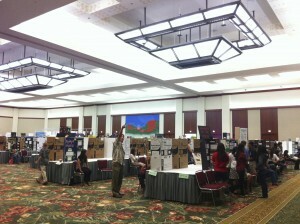 STEM Week will take place April 3-5, 2012 at the Hawaii Convention Center. The expo will be open from noon to 4:00 p.m. on April 3rd, 10 to 4pm on the 4th, and from 9:00 a.m. to 11:30 a.m. on April 5. The STEM awards banquet will follow at 11:30 a.m. on April 5. Preparations are well underway, and organizers are currently inviting local companies and groups to participate in STEM Week via the industry expo or as event sponsors. For more information on attending the event or sponsoring STEM Week, please visit STEMWeekHawaii.org or email kerrykak@hawaii.edu. The Hawaii Academy of Science is a 501(c)(3) nonprofit, tax exempt charitable organization committed to promoting scientific research and education in Hawaii and the Pacific Rim. The Academy is particularly interested in developing and executing programs and experiences for the science and learning communities. In addition to the Hawaii State Science & Engineering Fair, projects include the Pacific Symposium for Science & Sustainability (PS3) and Science Cafe. For more information, visit hawaiiacademyofscience.org.